The familiar home improvement product known as sandpaper consists of cloth or paper backing material impregnated with abrasive particles such as aluminum oxide or silicon carbide. It has a variety of uses in home repair activities but is most often used to clean and smooth wood or metal in preparation for finishing or painting. To use sandpaper properly, you must know how to choose the right grits. Sandpaper grits are categorized according to the coarseness of the abrasive particles used. In general, the process of preparing any surface in for painting or finishing involves sanding with progressively finer grits until you reach the desired level of smoothness. Use a sandpaper that is too coarse, and the surface will be too rough to paint or finish smoothly, or you may sand away fine detail on a furniture piece. Sanding with sandpaper that is too fine will require a lot of sanding and effort to get to the desired results. Choosing the right sandpaper grits and using them correctly is something of an art form. Sandpaper grit is sized by a gauge number, with lower numbers signifying larger, coarser grits. 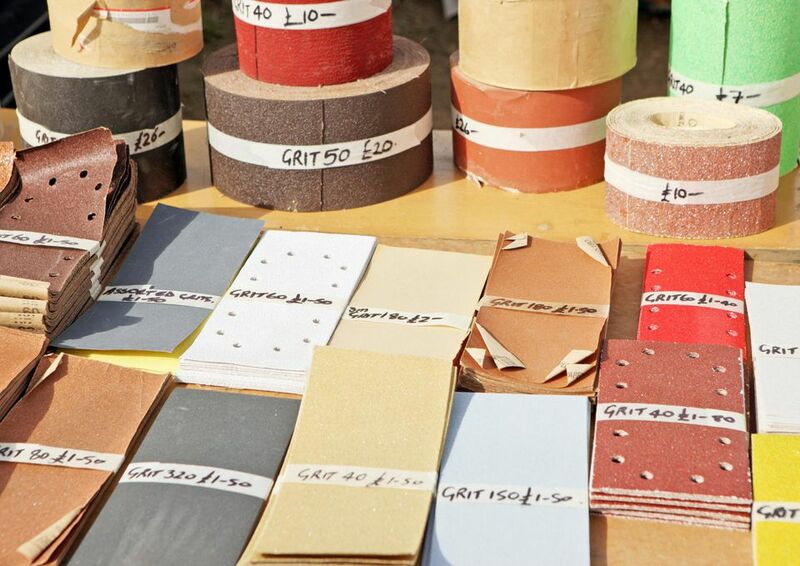 So, for example, 24- or 40-grit sandpaper is a very coarse, rough sandpaper, while 1000-grit paper is extremely fine with very small abrasive particles. The grit number of sandpaper is almost always clearly printed on the back of the sandpaper itself. Grit numbers range from 24 all the way up to 1,000, although most people will never use grits at the top or bottom of this scale. The number scale refers to the number of holes per square inch in the screens that are used when sieving the abrasive grains during the sandpaper's manufacture. For example, in a 60-grit sandpaper, the abrasive particles used in the paper were sieved through a screen that had 60 holes per square inch. Coarser, or lower-grit, sandpaper removes wood and other materials faster and with less effort than finer sandpaper. It does this by cutting the fibers on the material's surface. Aggressive scratching is good when you want to remove a lot of material, shape an edge, or remove old paint or blemishes, but the coarse sandpaper also leaves deep scratches in its wake. If you're not careful, this can easily damage your project. At the other end of the spectrum, very fine sandpaper removes a tiny amount of material, with the effect of smoothing the surface. The finer the paper, the smoother the surface. The concern here is that if you switch to a fine paper too soon, you'll spend a lot of time sanding to get the results you want. Also, sanding wood with too-fine paper, or sanding too much, can actually burnish the surface, creating overworked areas that can hinder absorption of stain and other finishes. Excessively sanded wood can create a blotchy appearance when stained and finished. The trick, then, is to start with the highest grit (coarsest sandpaper) that will meet your needs relatively quickly, then move up to progressively higher grits (smoother papers) as the surface gets closer to the finished product—and to stop when it's smooth enough for your liking. #60–#80 (coarse)—cuts through old paint and rough edges with relative ease. Also shapes and rounds edges. Not recommended for fine details or edges and corners you want to keep sharp. Also, be very careful using this on plywood, which has thin face layers that are easy to sand through. #180–#220 (fine)—seldom used on the first run-through, unless the surface is already smooth the touch. Grits in this range are typically for second or third sandings. Sometimes, fine grit sandpaper is used to roughen glossy paint in preparation for applying another coat. Bare wood that will be stained usually should not be sanded with higher than 220-grit paper. #320 and up (ultra-fine)—used to achieve another level of smoothness on all types of materials. With wood, ultra-fine grits usually are reserved for smoothing painted surfaces between coats. Many finer grits are used for wet sanding, which creates a fine, gritty slurry that complements the sandpaper's efforts at smoothing.